This extravagant, lush, bridal bouquet is the perfect mixture of elegant ivory foam roses, ornamental cabbage, and silk periodot hydrangeas, all beautifully contrasted against the blazing red vibrancy of exotic Mediterranean anemone blossoms. Unlike natural flowers, the beauty of these silky “forever flowers” will never fade—enduring as a sentimental keepsake and eternal reminder of your wedding vows and lasting love. 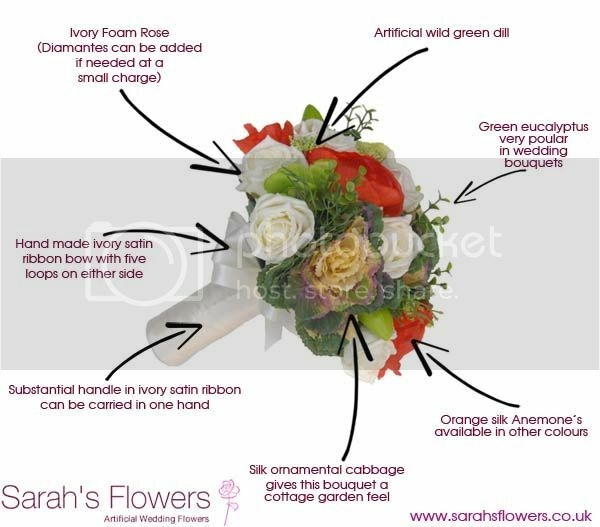 This entry was posted in Brides, General Interest and tagged artificial, artificial wedding flowers, Bouquet, bridal wedding bouquet, Bride, Brides, Brides bouquet, brides posy, fake, faux, forever flowers, ivory rose, red anemone, sarahs flowers, silk flowers, wedding day flowers, Wedding flowers, wedding posy.